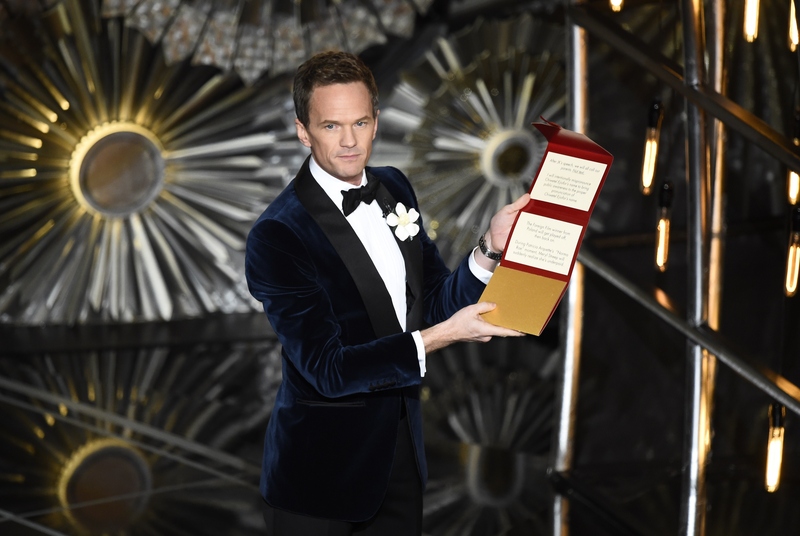 Tonight, millions of people around the country tuned in to the 87th Annual Academy Awards, broadcast live from the Dolby Theatre in Los Angeles, hosted by star of stage and screen Neil Patrick Harris. Some of the people watching were anxiously awaiting the results of the Academy's votes. Others were watching for the fashion as celebrities glided down the red carpet. And still others were just hoping to hear famous people say something funny when their teleprompter inevitably broke. That's why we need to remember the best quotes from the 2015 Oscars. But flubs aren't the only Oscar quotes we remember years later. We also remember when stars are refreshingly self-deprecating, like when Meryl Streep won her third statuette in 2012 for The Iron Lady: "When they called my name, I had this feeling I could hear half of America going, 'Oh no. Come on... Her, again?'" We remember their off-the-cuff improvisations, like David Niven's quip after a streaker ran across the stage at the 1974 ceremony: "The only laugh that man will ever get in his life is by stripping off and showing his shortcomings." And we remember the stars' hilariously over-the-top reactions to winning, like Sally Field's oft-misquoted acceptance speech for 1984's Places In The Heart: "I can't deny the fact that you like me — right now, you like me!" Approximately two seconds into his opening monologue, host NPH established the self-aware tone of the evening with this jab at the fact that 2015 is the first year since 1998 in which all 20 acting nominees are white. NPH wrapped up his monologue with a touching moment. Celebrating the many moving parts it takes to make a moving picture... including those of us who participate by watching them. But he veers away from the schmaltz pretty quickly, poking fun at himself for his role in the much-derided animated comedy. While accepting his Oscar for his supporting role in Whiplash, Simmons delivered a moving tribute to the supportive parents all around the world, encouraging young people to put down their "jean screens" and actually call their folks. NPH is referencing the Miramax über-producer, who is famously for ruthlessly campaigning his films all the way to Oscar gold — as in 1999, when he pushed Shakespeare In Love to victory over assumed frontrunner Saving Private Ryan. The adorable host gets as flustered around Magic Mike and Foxcatcher star Channing Tatum as the rest of us would, apparently. Winner Mat Kirkby tries going off-script in his acceptance speech for his Live Action Short Film The Phone Call... and then quickly changes his mind for the better. Parodying a scene from Birdman, NPH's robe got caught in his dressing room door and he had to go out on stage in nothing but his skivvies. The star of Into The Woods quipped about her own small stature while presenting this category with the similarly short Kevin Hart. NPH introducing the Animated Feature Film category, featuring the single biggest snub of 2015. NPH introduced the star of The Imitation Game with this reference to John Travolta's famous gaffe. Idina Menzel, introducing her co-presenter, John Travolta. The singer accept the award for his Best Original Song "Glory" with this eloquent speech about civil rights, and the Martin Luther King, Jr. biopic's parallels to today's struggles. The screenwriter of the Alan Turing biopic The Imitation Game took the opportunity of his Oscar victory to give this heartfelt confession and to deliver these stirring words of encouragement to outsiders everywhere.